Access to 2,000 natural lakes, 800 reservoirs and 9,500 miles of streams—including 321 miles of Gold Medal Trout Waters— makes Colorado a prime fishing destination. Enjoy remote access to stunning streams with mountain views, hire knowledgeable local guides to share their secrets, and discover a holiday or weekend getaway that encourages a balance of ease and adventure. Anglers can find success whether from the dock or shore, a pontoon or raft, or with your feet firmly planted on the river bed. When casting in Colorado, what you reel in is limited only by how many hours you spend on the water. What you find on the end of your line may include rainbow, cutthroat, brown, brook or lake trout; splake, kokanee salmon, grayling, mountain whitefish, wiper, walleye, saugeye, yellow perch, crappie, bluegill, green sunfish, channel catfish, smallmouth and largemouth bass, white and rock bass, northern pike, or tiger muskie. 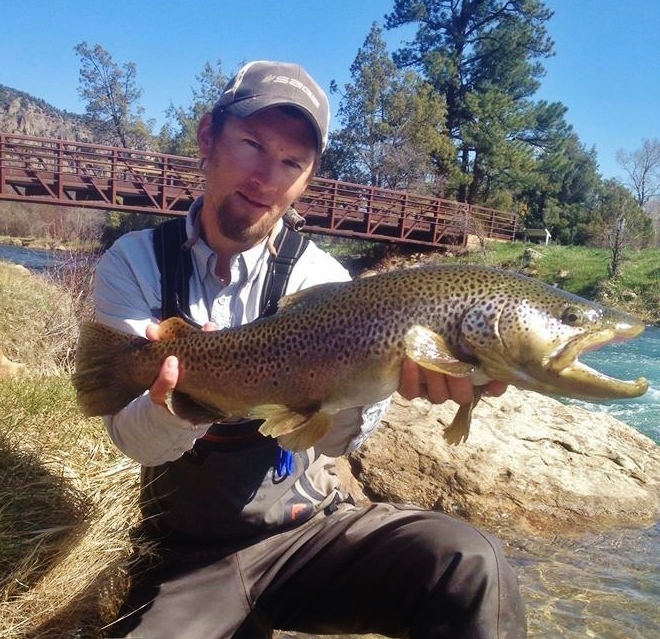 Catch-and-release fishing is supported on Colorado waters. Colorado Parks and Wildlife (CPW) fishing regulations outline what you can and can’t take, how you can take it, and how you can help preserve Colorado waters for future fishing. Remember to pick up your fishing license, available at one of over 700 licensed vendors statewide. 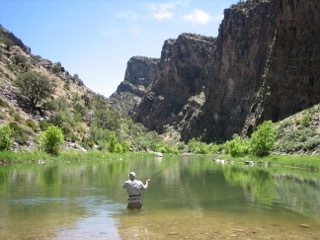 Fishing is great at Gunnison River Farm. With more fish than people, the rivers, streams, ponds and lakes of Delta County present some of the finest fishing on the Western Slope of the Rockies. It’s the quantity and variety, escape from the crowds, diverse fish species and strong fly hatches that make the area exceptional. 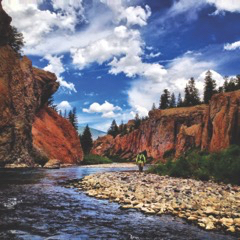 For an all-in-one fishing experience, stay in cabins at the beautiful Gunnison River Farms, a 1000-acre paradise, and enjoy white-water rafting and 3.5 miles of private river fishing in the stunning Gunnison River Gorge with on-site hosts, Black Canyon Anglers. Pitch a tent, pack your cooler and grab your fishing pole. Colorado has 42 State Parks and many of them offer campsites near the shoreline. Chatfield State Park and Lake Pueblo State Park are featured on “America’s Top 100 Family Fishing and Boating Spots.” Just outside Denver, Aurora Reservoir was named “The Best Park for Fishing” by Westword in 2012. In Ridgway State Park, fish the productive tailwater of the Uncompahgre River set against a backdrop of stunning peaks and vast wilderness. Visit the recently opened Fishing Camp on the Tarryall River—the newest Broadmoor Wilderness Experience Property – where guided fishing on five miles of pristine, private waters is complimented by sunrise cowboy coffee and campfires under clear, starry skies. Head to Dunton River Camp for “glamping” in beautiful tents nestled into woods 30 feet above the river and enjoy some of the best fly-fishing in North America on the West Fork of the Dolores. Enjoy quiet time and privacy at Lake City, Colorado. Whether casting for the biggest catch or looking for a place to slip silently into a stream and enjoy some solo time, Colorado is an angler’s paradise. The state's breathtaking scenic landscape boasts natural hot springs, the headwaters of seven major rivers, many peaceful lakes and reservoirs, 11 national parks and monuments, over 850 visitor-friendly farms and ranches, and 58 mountain peaks over 14,000 feet. For more information visit www.COLORADO.com Media are invited to visit the Colorado Media Room for story ideas, news releases, image gallery, and other resources.